Jonathan Bondi was working for the Board of Elections when he took two weeks off to help his wife, Tara, open their new cupcake store on Grand Island. Everyone told them they were crazy. “Every single person told us not to do it on Grand Island, and that we needed more than cupcakes,” he said. But they had an inspiration, sister-in-law Heather McDonnell, the season three winner of Food Network’s “Cupcake Wars,” who helped Tara learn. “She’s a genius,” Bondi said of McDonnell. 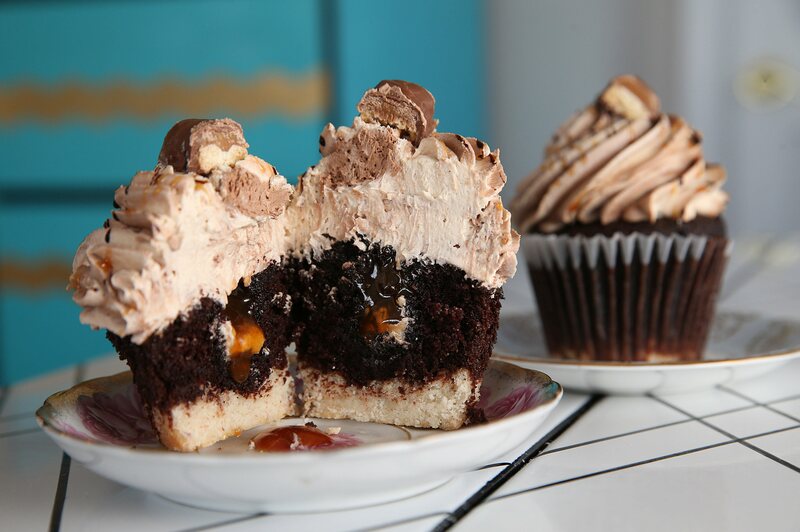 The Twix is one of the most complex cupcakes they make. It starts with a shortbread crust in the bottom, which is baked before being covered with a layer of chocolate cake. A small coring is removed so it can be filled with caramel sauce. “We top it with a swirl of chocolate and caramel buttercream frosting, our two best frostings, swirled together, and the presentation reminds me of a swirled ice cream cone,” said Bondi. Then it’s topped with a whole half of a Twix bar. Right or left Twix? “We don’t discriminate,” he said with a laugh. At Baked Cupcakery, cupcakes come in jumbo, regular and mini size; a jumbo Twix cupcake is $3.